Overview of the X-Men slot. In the comic book world, the X-Men truly stand out for popularity. This Marvel comic has become huge, an entire world in many regards, while still being in the same universe as the Avengers. The same phenomenon saw the X-Men movie series become an entity in its own right. The X-Men include some of comics’ most famous characters, such as Wolverine, Professor X and Mystique. This 5-reel slot game really captures the action vibe of the X-Men movies and seems to style itself more after the movies than the comics. For example, they use the leather armour outfits seen in the movies and Wolverine is styled after his Hugh Jackman incarnation. With a 95% RPT or Return to Player and two bonus rounds, this is certainly a slot that will attract attention. Let’s find out more about this iconic comic book series and the game itself. The X-Men are a team of superheroes who were first seen way back in 1963, designed by Stan Lee and Jack Kirby. The X-Men have evolved to become a whole world of characters, so these comics don’t just include actual members of the team but also a host of other characters and some very iconic villains. X-Men are mutants who have been born with amazing powers, but are shunned by the world and taken in by Professor X, a telepath who protects and guides them. Perhaps the best known X-Men are Wolverine with his adamantium claws, Cyclops with his laser eyes, Jean Grey the psychic and villains like Magneto who can control magnetic fields. These characters did wonders for the X-Men movie series, which started in 2000 and spawned nine sequels, including Logan and Deadpool. 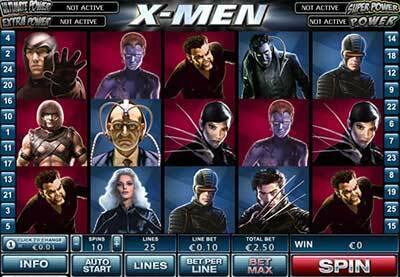 This massive level of popularity means the X-Men slot has also become very popular, helped by making these themes of heroes and villains a part of the bonus round. The X-Men slot is one of the best-looking Marvel slots out there, though some fans may dislike the art style. The slot seems to take cues from the movies, shown in the outfits and the appearance of Wolverine and Mystique, but other characters simply look original such as a youngish Magneto. Each character symbol has an animation, with Mystique’s really standing out as she shapeshifts into the other characters- her signature move. Characters featured also include Lady Deathstrike, Juggernaut, Cyclops, Professor X, Sabretooth (in his Origins incarnation), Storm and Nightcrawler. This suggests that the slot is not meant to follow any one movie in particular as this is a spread from several movies. The game is sadly lacking any more detailed animations and doesn’t have an animated bonus round, but all the art is solid and the music is fitting too. The basic mechanic is simple and features 25 paylines, which is 25 ways for your symbols to land in and give you a win. It may take new players a little time to get to grips with the bonus and symbol systems but they really capture the feel of X-Men and give weight to the villains as much as the heroes. Many of the symbols double up, so Wolverine and Lady Deathstrike are worth the same, being opposites in the comics. The same is true of rivals Magneto and Professor X, plus these can grant you extra wilds in the free games mode. There is a standard wild symbol too. The X-Feature is triggered when any hero symbols occupy one of the ‘X’ positions at the middle of the reel. When this happens you immediately get a prize of 5x your total bet! There’s also the Free Games, triggered by three or more X-Men logos, which starts in Heroes mode and can turn to Villains mode if Magneto drops in. This gives you indefinite free spins until it turns to Villains mode, then you get 8 spins to try to get back to Heroes mode. In each mode, the opposing team leader is extra wild. This is a fun way to represent the battle of good and evil! Lastly, this slot has four Marvel Jackpot progressives that can be won any time. Disclaimer: All comic book symbols, logos or other related icons are property of their respecive owners.